It´s fast and there are several technical demanding sections around the track. The track is a bit wider than most kart-tracks, so it´s fast and very well suited for online competitions. There are currently no setups for DINO. Add a Setup. Yes, I can post the track-layout. Thanks for this beautiful track. Is it possible to show us the plan? I don´t know why there is no link, i uploaded months ago and has been wondering why it didn´t show up under released tracks. Now I see it here under works in progress. 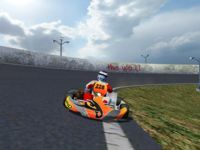 fantastic kart track, Normak! excellent! thank you for it!!! !